According to a Pentagon history of the F-35, Darpa quietly sought assistance from a research and development arm of Lockheed Martin known as the Skunk Works. By the early 1990s, the Darpa-Skunk Works collaboration had produced preliminary concepts, and the Marine Corps began pressing Congress for funding. The Air Force and Navy insisted that they, too, needed stealthy, supersonic fighters to replace aging Cold War-era models. Out of this clamoring grew a consensus that the only way to afford thousands of cutting-edge fighters was to build a basic model that could be customized for each service. “In terms of future tactical aircraft, this was the program,” says Frank Kendall, a senior Pentagon acquisition official during the Clinton and Obama administrations. 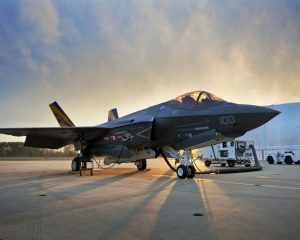 “There was no other program.” Bloomberg Businessweek, Is the F-35 a Trillion-Dollar Mistake? April 4, 2017. It was a nice little product we had. We had our project approved and moving along nicely. We were getting kudos for how well we worked with everyone and how well we had anticipated and planned for each department’s needs. Our planning and execution was informed by having studied the last few product projects in our class. We were going to show them how it was done. We were already hitting all our early deadlines, which had never been achieved by any project in the past. The company, however, was looking for their next big killer mega product. They spotted our effort, heard how it was being managed so well, and decided to “leverage” it. They tripled the number of products we would produce, increased the number of requirements for the product line by over 400% and pulled the previously approved deadline in by two months. We essentially lost control of our project. It did, in fact, deliver on the original date we predicted, which was amazing. The products were super buggy and the high-end version of the product was delayed and hence never sold well. However, the low-end of the product line was fairly popular with the consumer and sold well for years. For more see the amazing Clydesdales: Is Your Project Schedule Really Driven By Your Requirements? The lesson learned here was that if we do a good job at managing a project, we may get more attention than is good for our project. It took us years to clean up the quality of the product line, in particular the software, before we could finally, once again, launch a high-quality project. We succeeded and finally delivered good products on time with good quality. So, if you manage your projects well, be prepared to have a trillion dollar behemoth dropped in your lap and, no, it probably won’t go well. Compare with: Doing Well? Get Taken For Granted! How prepared are you and your team to handle a massive upsizing of your project should that ever happen?